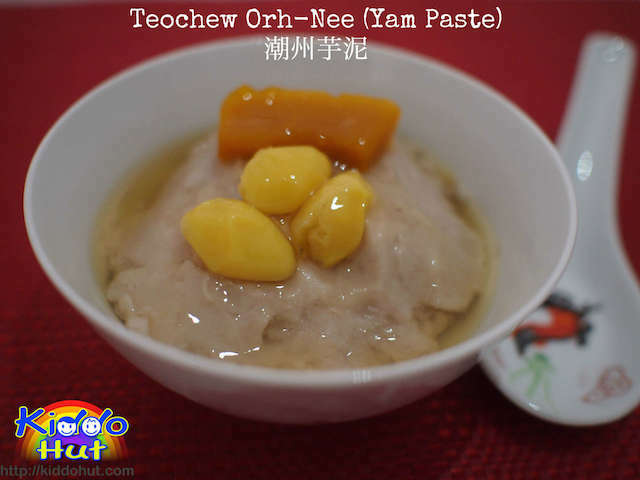 As the name suggests, usually you can find Teochew Orh-Nee (Yam Paste) in Teochew Chinese restaurants as it is a traditional Teochew cuisine. The Teochew people (潮州人) are Chinese native to the Chaoshan (潮汕) region of eastern Guangdong province in China who speaks the Teochew dialect. From the 19th century, significant numbers of Teochew people left their homeland and migrate to Singapore. (Source: Wikipedi) As of today, Teochew is the second largest spoken dialect in Singapore. Teochew culture is a very immense culture with distinct Teochew opera, Teochew music, Teochew woodcarving and not to mention Teochew Cuisine. Personally, my mum is a Teochew and since young, I have been speaking Teochew at home, and I always get to taste Teochew cuisine whipped up by my maternal grandmother as well. There are few Teochew cuisine I love especially, and Teochew Orh-Nee (Yam Paste) is one of those. Teochew is a wonderful dialect and by knowing this spoken dialect, it has benefitted me in many ways. Coincidentally, I too married to a Teochew husband. 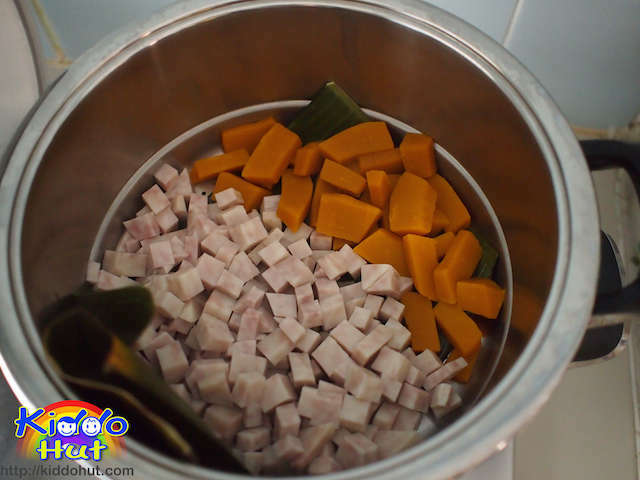 Frankly speaking, most Teochew cuisines are time-consuming to prepare. Orh-Nee is one of those. The reason for choosing to do Orh-Nee, because those I get from the restaurants or stalls are always too sweet to my liking or too oily. 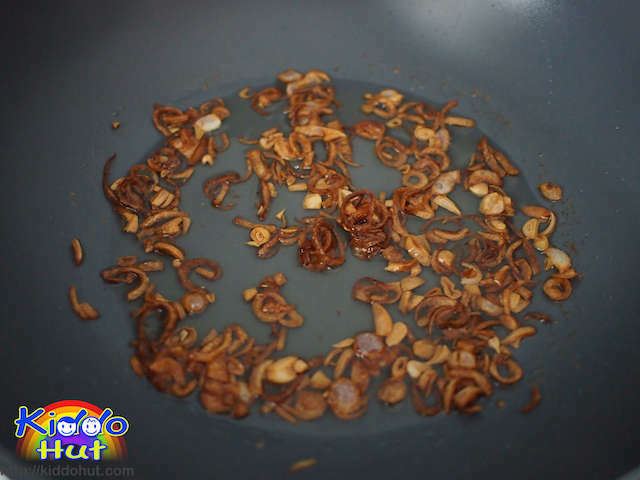 One of the crux of delicious Orh-nee is the fragrance of the freshly-made Shallot oil, if you buy it from the wrong stalls, you may end up with an Orh-Nee with smelly shallot oil (the oil which has been stored for too long or reused for too many times). 1. One of the key ingredients is gingko nuts (白果/银杏/银果), it is always better to use those unshelled ones. But, if due to time constraint or simply doesn’t mind the taste of the gingko nuts, you can purchase the ready-peeled gingko nuts. Do remember to take out the “heart” in the gingko nut. Gingko nut has medical functions, whilst at the same time, it is toxic too especially for children. The toxicity cannot be destroyed from cooking. So it is advised to eat in limited quantity, the rule of thumb is 7. Also, some elderly would advise to remove the well-developed embryo inside the nut which is commonly known as the “heart” of gingko nut. 2. As everyone’s preference for sweetness differs, instead of sweeten just the yam paste, I prepare the sugar syrup for pouring over the yam paste to give some shine to the paste and enable each and individual to decide on their level of sweetness. 3. Another key ingredient is the shallot oil. When cooking the shallot, when the shallot is turning to golden brown, off the heat and continue to stir until brownish then quickly strain it. Else, the oil will have a burnt smell which affects the taste of the yam paste. 4. 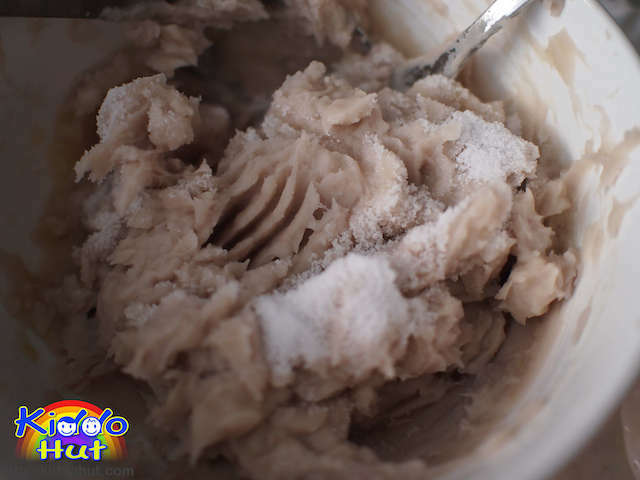 You need to amalgamate the yam paste and the shallot oil well enough to ensure the fragrance of the shallot oil gets into every mouth of the yam paste. 5. Instead of mashing the pumpkin, I chose to serve the pumpkin in slice to give different texture within the yam paste. 6. The most important ingredient which is the Chinese Yam, frankly I am no expert in picking the best yam. What I simply did, is to go to the wet market and ask the stall holder to pick me the most “sang” (松) yam. 7. Mash the yam right after steaming. It is easier to mash while it is still hot. 1. Crack the gingko nuts, de-shell and peel the skin of the gingko nuts. 2. Bring the 500ml of water to boil, add the brown sugar slabs, peeled gingko nuts and pandan leaves, thereafter cook for 30 minutes. Leave the gingko nuts in the sugar syrup for at least an hour to overnight. Steps 1 & 2 won’t be necessary if you are using the ready-to-use gingko nuts. You just need to boil 400ml of water, add 160ml of brown sugar slabs, cooked gingko nuts and pandan leaves, cook for 15 minutes. Then leave the gingko nuts in the sugar syrup for at least an hour to overnight to make candied gingko nuts. 3. Drain the gingko nuts and keep the sugar syrup. 4. Dice the yam and slice the pumpkin, then steam for 20 minutes. 6. 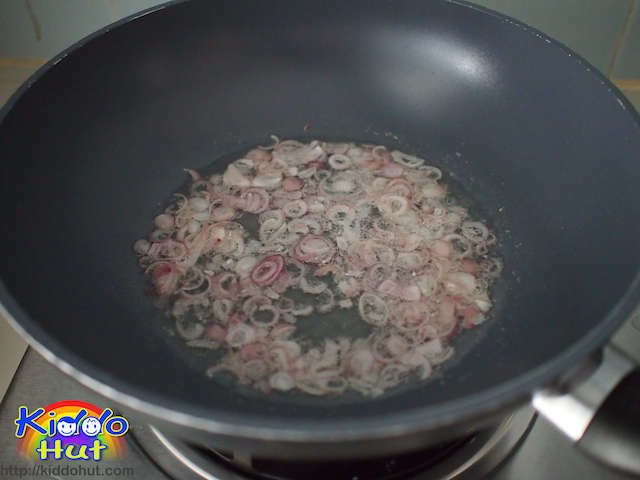 While steaming, fry the sliced shallot in the 100ml of oil. Gently stir fry on medium low heat until it is turning golden brown. Off the heat and continue to stir until it turns brown and crisp up. Drain the fried shallot and keep it for other uses. 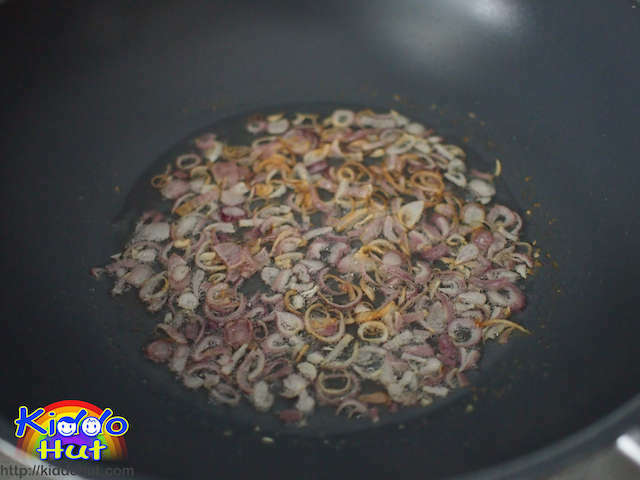 Leave the shallot oil in the wok. 7. Mash the yam using the back of the fork. Add the 2 tbsp of sugar while mashing. Then add another 2-3 tbsp of the sugar syrup prepared earlier. Adjust sweetness to preference. 1. Heat up the shallot oil under low heat, add the mashed yam / taro paste and stir until well amalgamated. Taste for sweetness and add more sugar syrup if necessary. I didn’t add any more sugar syrup. 2. Let the yam paste cool down. 3. While the yam paste is cooling, transfer the sugar syrup to a pot. Mix the 2 tbsp of sweet potato flour in 20ml of water. When the sugar syrup is boiling, turn to low heat and stir in the sweet potato starch gradually. Stop adding at the desired thickness. 4. 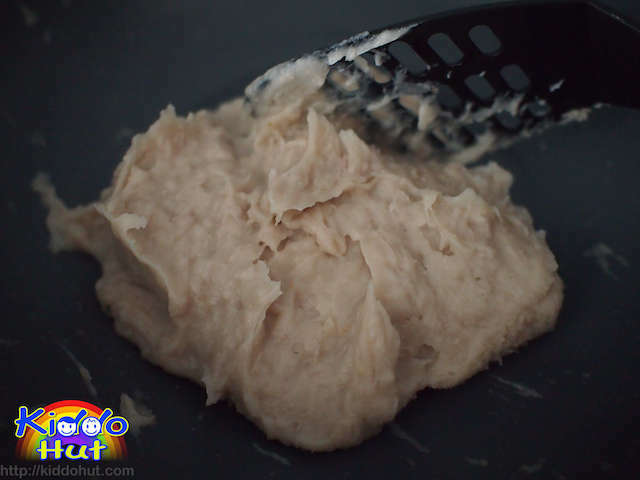 After the yam paste is cooled, if you prefer a smoother texture, blend the yam paste in a blender. I didn’t. 5. Put a scoop of the yam paste in the bowl, add a slice of pumpkin and 3 candied gingko nuts on top. Pour some sugar syrup. Serve. Traditionally, Orh-Nee may be served with coconut milk. If you prefer to do that, add the coconut milk when you cook the yam paste in the shallot oil. 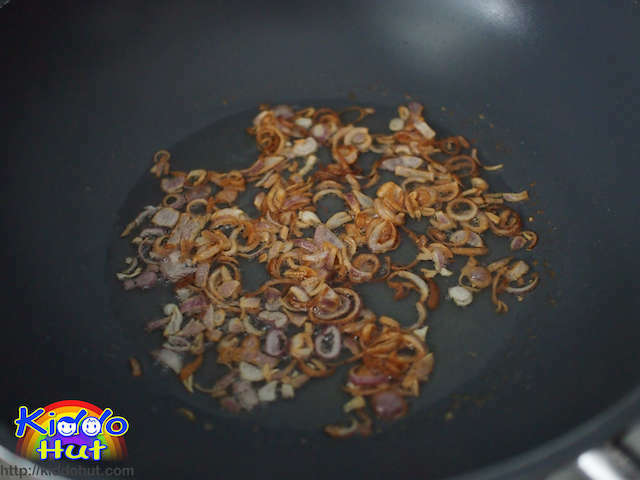 Cut the shallot oil to 50ml then add to desired texture. Whereas, some restaurants serve with pouring some coconut milk onto the yam paste before serving. You may boil the coconut milk before serving.